- is my first full collection, published by Oversteps Books in February 2013. It was launched in March at a reading at StAnza International Poetry Festival. 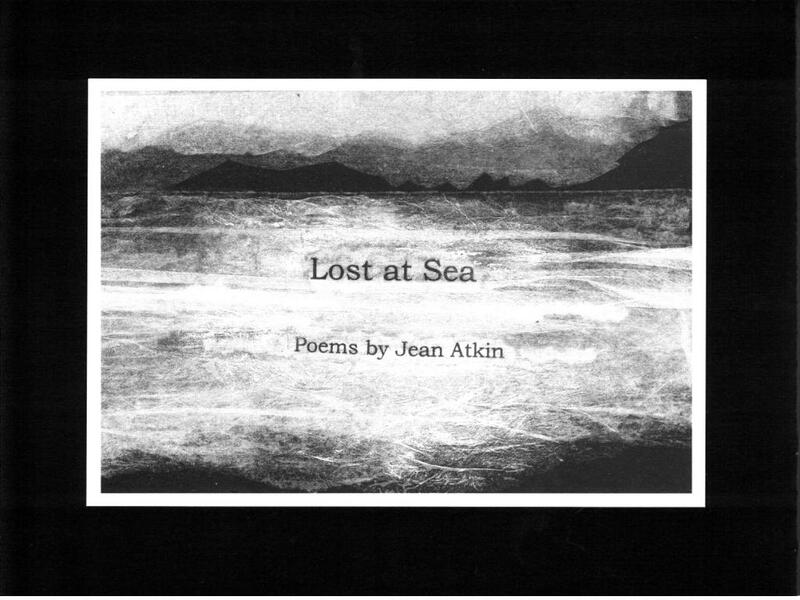 "Jean Atkin’s poems take us on a journey through abandoned Galloway fermtouns and lost communities under dark, starry skies. Her lines flicker with soft, intense light as they slip between the living and the dead, naming and remembering those whose ghostly presences are ‘soaked//into the stone, the scuff/of boots at the bothy’s step'. Deft and clear-eyed, these poems honour life without flinching." "Jean Atkin has the gift of rendering her landscapes and seascapes instantly recognisable yet revelatory. She tellingly interweaves the past and the present, the poignancy of memory and myth, and the resonance of place-names. Her sense of form and rhythmic instinct are unerring. And her affirmative view of the natural world and its creatures, depicted in all their vibrancy and physicality, is both enhanced and tempered by an awareness of humankind's responsibilities. 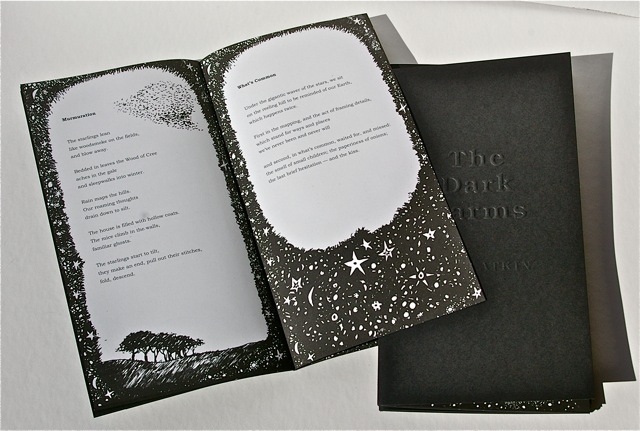 These are poems to savour, to marvel at and to delight in." The past may be, in L.P. Hartley's phrase, a foreign country, where things are done differently, but in these poems Jean Atkin brings it memorably to life so that we see it, hear it, smell it and touch it." The Dark Farms was launched at the 2012 Wigtown Book Festival, and is published by Roncadora Press. I spent from late winter through to autumn of 2011 walking, reading and clambering into ruins in the Galloway Forest in south west Scotland. The Forest is 300 square miles of mountains, moorland, peat bog, ancient oak and birch alongside 20th century conifer plantation. It's full of upland farms, many of which are now abandoned. There are few roads. Due to its lack of light pollution, this is one of the best places in the world to see the stars. The area was designated an International Dark Skies Park in 2008.
to feel for what's not there. Lost at Sea is my 2011 pamphlet from Roncadora Press. Lost At Sea is almost a travelogue in which both the Shetland Islands and my great grandfather and his family are explored, and glimpses caught of them. Lost at Sea was shortlisted for the 2011 Callum Macdonald Memorial Award for pamphlet poetry. 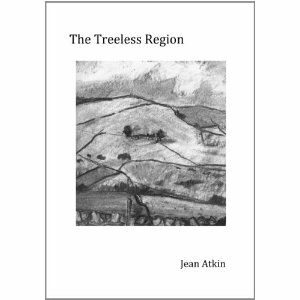 The Treeless Region is my short collection of poems published by Ravenglass Poetry Press in 2010 - publication was the prize for winning the Ravenglass Poetry Press Competition, judged by John Burnside. Jean Atkin writes about the landscapes of Dumfries and Galloway, where she farms. The Treeless Region (Ravenglass £4.99) is an unsentimental celebration of farm work - milking, lambing, coppicing and harvesting. Jean Atkin reflects on the necessary involvement of humankind in keeping the countryside from chaos. She grew up in Cumbria 'with a semi‐feral outdoor life and a bookish indoor life' and now lives in Dumfries and Galloway. 'Species Loss',chosen for our Poem of the Day in The Herald, comes from her collection The Treeless Region (Ravenglass Poetry Press), an imaginative response to rural themes. Please contact me if you would like to buy a copy - PayPal and I are having a difference of opinion. Jean Atkin. Simple theme. Powered by Blogger.